Before we get started, I have a confession to make. As an American citizen who was born two years after the British burned Washington, D.C. in the War of 1812, I find the modern-day fascination with the English royal family as vexing as it is amusing. Is it because we never had kings and queens of our own to follow? (The menacing sorts that our ancestors revolted from in the 1700s?) Was the BBC or that Downton Abbey televised program to blame? One thing I can attest to as a historical bystander is that whispers of visiting royalty can send even the most sensible patriots into an unabashed tizzy. When Queen Elizabeth II and her husband, Prince Phillip, made a measly 14-hour stop in Chicago in 1959, one might have thought we had just won another war! Thousands and thousands of admirers clutching the once-despised Union Jack filled both sides of State Street as the royal couple passed by in a limousine with Mayor Richard J. Daley on their way to the Drake Hotel. Granted, it was the first time a reigning monarch had ever visited Chicago (and the only United States stop on a 45-day tour mostly focused on Canadian provinces) but I found such an unrestrained display of adoration a bit excessive. There was, however, a certain visiting royal who did capture my undying respect and admiration nearly three decades later. Like the esteemed young lady illustrated so vividly on the cover of this magazine, the late, great Princess Diana of Wales had not been born to royalty. And at the time of her much-acclaimed visit to our Northwestern University campus in 1996, she wasn’t even married to Prince Charles anymore (who, if you’re a hopeless devotee such things, you know is Queen Elizabeth II’s first-born child and heir to the throne. Young Charles was back at home with the nanny when his mum created such a fuss here on State Street). Diana’s gravitas among those who followed her went beyond the usual royal family nonsense. The always humble and astoundingly sincere Princess of Wales was in the Chicago area for three days that June not for a pompous cup of English tea at The Drake but to raise necessary funds for the research of a terrible disease called cancer. She also made a point to visit my beloved Northwestern campus, arriving at the Weber Arch in an exquisite black Rolls-Royce (which is now deservedly on display at the Volo Auto Museum). What I remember most is her choice of attire one night at a formal event she attended in Chicago—a modest yet becoming frock in Northwestern purple. Oh, what a sweet violet it was. Just the right hue. Even though we didn’t adopt this as our “official color” until after the Civil War (around the 1870s) I like it quite a lot, and therefore found the princess’s gesture in wearing it that evening to be highly commendable. To be completely honest, I was smitten. Associated Student Government President Leontine Chuang (class of 1997) had the esteemed privilege of giving the fair lady a tour of the Evanston campus. The Princess was also welcomed at the home of Northwestern President (now emeritus) Henry Bienen, who used the opportunity to invite breast cancer researchers, Northwestern trustees, local mayors, and even the governor of Illinois at the time, Jim Edgar (who attended with his wife, Brenda). Throngs were so massive near the lakefront that evening that it was nearly impossible to pass. From onlookers and news media to mere gawkers, the royal frenzy had overcome them like a fever, though I confess I had begun to understand why. The next day, our lovely Diana presented opening remarks at the Northwestern University Symposium on Breast Cancer at the Pritzker School of Law’s Thorne Auditorium. “No other women has the ability to so effectively focus the world’s attention on such critical issues,” President Bienen did say. Sadly, I was not chosen to accompany her to the black-tie fundraising gala at the Field Museum. But I did sneak in long enough to behold the spectacular floor-length Versace evening gown in glorious Northwestern purple. Not to gush, but it was quite the affair. A crooner named Mr. Tony Bennett serenaded the Princess like I had only dreamed, and the mother of a basketball celebrity named Michael Jordan provided autographed Chicago Bulls (the name of our local team, I’m told) souvenirs for Diana’s young sons—William and Harry. She even was invited to attend a final sort of match in this NBA that resulted in some sort of important victory for these Chicago Bulls. I am told it was also historic in the sporting world, though I’m not into that sort of thing. 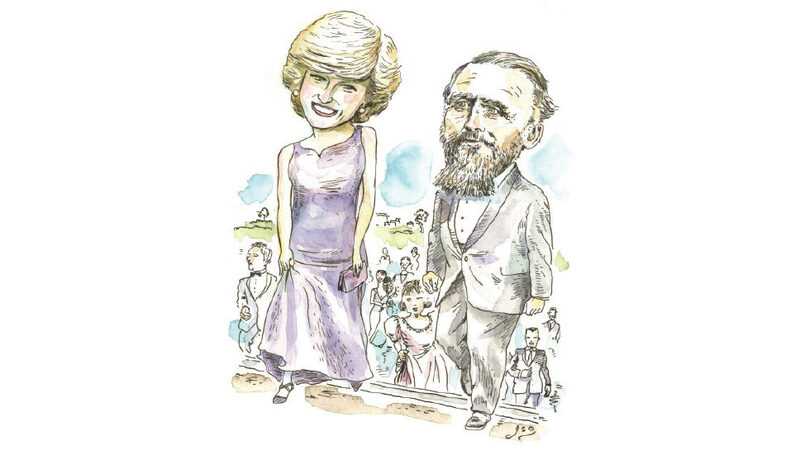 In total, Princess Diana’s visit that year is said to have raised nearly $1.5 million for cancer research beneficiaries, including Robert H. Lurie Cancer Center. Northwestern director of media relations at that time, Pat Tremmel, admits that she was swept into the Princess’s magic. “It was like a figure from a fairytale come alive,” she told a writer for one of the Northwestern news outlets. To say that I can relate is an understatement. What I found most profound at this moment in time is the loyalty the Princess demonstrated to my Northwestern community. While I barely heard from her (which I have recovered from) she and Mr. Bienen became pen pals after that visit. She sent autographs and photos of herself with her boys. In exchange, he sent articles of purple clothing that bore the Northwestern Wildcat logo, which apparently, she loved so much she was photographed wearing them while working out at her London gymnasium. Sadly, those were the last months of her life. Perhaps it is sentimental for an old man such as myself to go on and on about such a chance encounter with a such a noble lady, or even reflect on the connection we now have at Northwestern as one of our graduates, Meghan Markle, is set to marry young Harry. If I were to speak to this royal gentleman, I would ask him to be kind and treat her well. I would also ask him if he remembers his mum carrying back gifts from a university called Northwestern, and a ghost of a man she met named John Evans.